Austria will be the only Western European state to have the far-right in government after the country's president approved a coalition deal between the conservative People's Party and Freedom Party. Head-of-State Alexander Van der Bellen signed off on the agreement after assurances the new government would be committed to both the EU and the European convention on human rights. 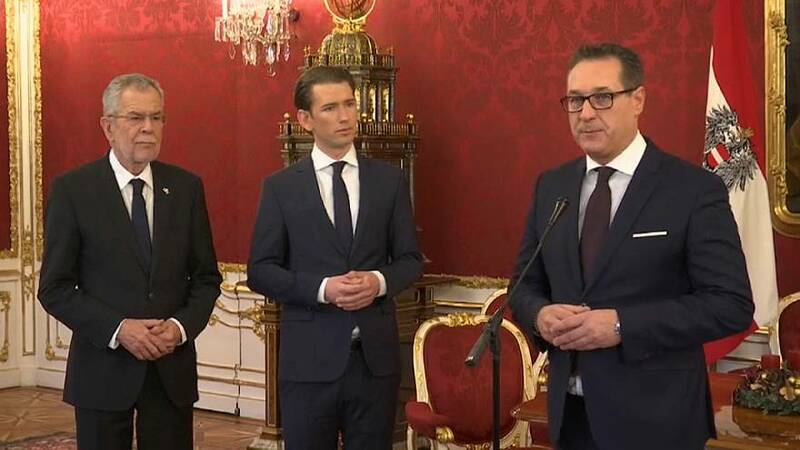 "In these talks, among other things, we agree that it is in the national interest of Austria to remain at the centre of a strong European Union and to actively participate in the future development of the EU,'' Van der Bellen said. At just 31, the People's Party leader, Sebastian Kurz, is the world's youngest head of government. "We have a good and strong team. Regarding my part of the team, 50% of that will be women. Two thirds of the proposed personnel are experts who are going to bring a lot of knowledge into these top political positions," Kurz said. The People's Party and Freedom Party governed Austria together between 2000 and 2005. Freedom Party leader (FPO) Heinz-Christian Strache said: "This is about responsibility for our wonderful republic of Austria. And it's about ensuring good cooperation for the future, too. Now we will discuss the results of the talks and also the ministerial proposals, which were just presented to the president." Strache's Freedom party had campaigned on an anti-EU and anti-migration ticket. For the moment however, no details have been given about the new coalition government's programme.